I lasted less than 30 minutes on the beach today. Rain soaked through my "rain-coat" (where is my favorite Grunden's yellow fishermen's rain coat?? ), through my sweater and through my t-shirt. Waves crashing on the beach were spectuclular! The Pelicans were having a blast dive bombing the waves, but the seagulls were just taking it all in stride. 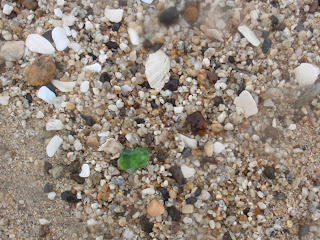 I even found a small smattering of sea glass - please excuse the rain drops on the camera lense..